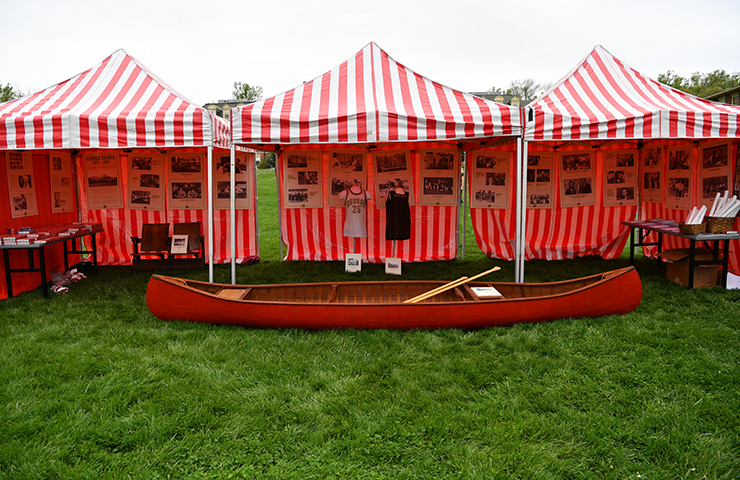 The canoe will be up for auction during George School’s upcoming 125th celebration, Embrace the World, a dinner, dance, and auction on October 20. Legendary arts teacher Palmer Sharpless taught many George School students to build canoes over his long tenure, but he only ever crafted one himself, marked with his distinctive “S” carved in the front crossbar. This priceless piece of George School history will go to the highest bidder at the upcoming Embrace the World dinner, dance, and auction event on Saturday, October, 20. Palmer’s one-of-a-kind canoe is up for auction during George School’s 125th celebration, Embrace the World. Proceeds from the event will support tuition assistance and faculty development. Auction items are available for a sneak preview and tickets are now on sale for Embrace the World at www.georgeschool.org/embracetheworld.